Keyboard shortcuts for adding, duplicating and deleting, undo, formatting and more. Create a new note: Double click anywhere to create a new note. Add notes quickly: While typing a note, hit ⌘ + Enter (Mac) or Ctrl + Enter (Windows) to create one note after another. 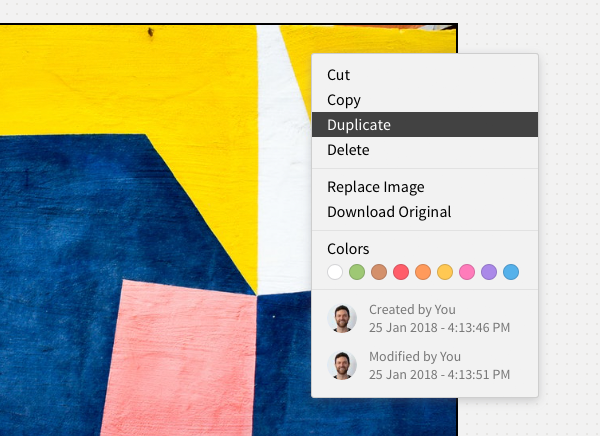 Duplicate: Hold Alt or Option and drag the content you want to duplicate. Delete: Select anything and hit Delete . Notes need to be empty before you can delete them. From your computer: Drag an image from your computer into Milanote. From the internet: Right click on the image, copy the address of the image, paste the image address into a Milanote Link card. ⌘ + F (Mac) or Ctrl + F (Windows). This is also the quickest way to jump between boards. Hold Space and Drag to move quickly around the board. It's easier than scrolling. Combine two or more cards into a column: Hold ⌘ (Mac) or Control (Windows) and drag one card onto another. Right-click any item in Milanote to show shortcuts related to the item.